← Ticking bombs or a shanda fur die goyim? As I write, the man who murdered two young Jewish men on Dizengoff Street in Tel Aviv, and possibly also an Arab taxi driver, is still at large. While the police are saying that this attack didn’t quite fit the profile of the Arab terrorism with which we have unfortunately become familiar in recent months, it made me think about how to stop the wave of murderous lone-wolf terrorism that has been washing over us since the beginning of October. Typically the perpetrators have been young people (teens and early twenties) from eastern Jerusalem or Judea/Samaria, male and female, who act out of fury in response to perceived Israeli actions. Justifications for terrorism might include insults to Islam like the alleged attempt to change the status quo on the Temple Mount, or the claimed ‘executions’ of Arabs by Israeli soldiers or police. A post on social media may spur the terrorist into action, and he or she will take a knife from the kitchen drawer and go out to stab a Jew. In many cases they don’t try to escape, prepared to die as martyrs. This happens against the background of the Palestinian Authority educational system, which has indoctrinated Arab children since Oslo to believe that Jews are evil, subhuman creatures, and that those who murder them are heroes, celebrated as exemplars for Palestinian Arab youth. In many cases their religious education has taught them — and they believe quite literally — that martyrs will go to paradise where they will obtain all the pleasures of the flesh that are denied to them in repressive Arab society. These attacks are extremely difficult to stop because they are usually not directly ordered by a terrorist group and are carried out with a minimum of planning and preparation. The perpetrators are usually not known to security forces. Sometimes there are warning signs, such as a person becoming extremely religious, losing interest in everything not connected with Islam, even saying goodbye to family members. Only a few of the tens of terrorists that have struck in the last few months have been Arab citizens of pre-1967 Israel like the Tel Aviv shooter, who was from the Wadi Ara region. Israeli Arabs tend to be better educated – and not by the PA – and less likely to believe some of the more outrageous stories in social media. They may also have had more encounters with Jews and, even if they feel some animosity toward them, at least see them as human beings. They may be more invested in careers and studies than the Arabs of the territories. What is interesting about this case is that the shooter’s identity became known after his father saw widely publicized security videos of the attack and recognized his son. The weapon belonged to the father, a volunteer police officer and a security guard, who kept it in a safe at home. After seeing the video and finding his semi-automatic weapon missing, he informed the police. I won’t speculate about the father’s motives. He said that he wanted his son to be caught before he killed anyone else. Cynics will say that he realized that his son would have been identified from the video in any case, and that information he provided might help the police capture him alive, or even that he wanted to avoid having the family home demolished. The family’s situation is tragic. In addition to the pain of turning his own son over to the police, the father may lose his job because he allowed his weapon to be taken. But it isn’t the first time a terror suspect was turned in by family members. In the case of the murder of Rabbi Ya’akov Litman and his son Netanel in November, the identity of the murderer was not known until his family informed police. Neither of these cases was a typical lone-wolf attack. The Litman murderer was a member of Islamic Jihad, and the Tel Aviv shooter seems to have planned his attack and his escape more carefully than most – and didn’t want to get caught. But the family connection has made me think that perhaps there is an approach that can work to stop some of these terror attacks. I’m sure some will say that it is immoral. But understand that at least 27 Israelis have been murdered in terrorist attacks since October 1, and many more seriously wounded. An even larger number of Arabs have been killed while trying to kill Jews. This simply can’t be allowed to continue. 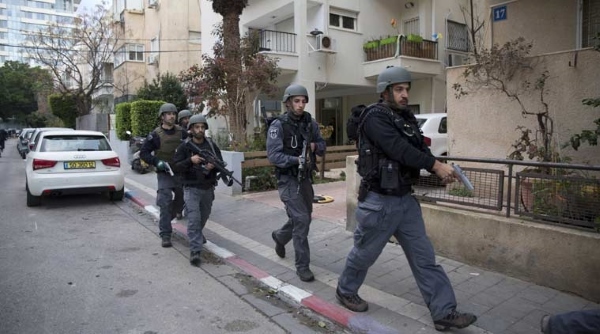 Israelis can’t be expected to walk around their neighborhoods with targets on their backs. In traditional Arab society the family hierarchy is very powerful. Sometimes, as in the case of so-called “honor killings” in which a woman is murdered by family members because she is suspected of embarrassing the family by having inappropriate sexual relations, or even because she doesn’t accept the family’s decision about whom she will marry, this in itself leads to tragedy. I suggest that the way to stop ‘lone wolf’ terrorism is to make it worthwhile for the family to nip it in the bud. This can be accomplished by collectively punishing the families of terrorists. Fines, home demolitions, and expulsion of the immediate family or even larger extended families should be employed. It should be made very clear what the consequences will be when a family member engages in terrorism, and the punishment should be swift and sure. I can hear the ‘human rights’ NGOs objecting that collective punishment violates international law, is unfair and immoral, and so on. But terrorist murder is all of those things too, and the decision to engage in it is made by the terrorist and not the security forces. The responsibility for what happens to the family thus falls on the terrorist. Traditional counter-terrorism methods have a hard time stopping totally random terrorism. But even ‘lone wolves’ have families. Excellent idea. Particularly within the culture in question, this should be very effective. But will Israeli leaders have the courage to do this? It takes a village to raise a terrorist, so they should be greatful a whole village isn’t erased after a dasterdly attack.